A hand painted French Country Pine Kitchen Table and 4 chairs with Vanessa Arbuthnott ~ Life and Eternity Ground ~ Spinach fabric. The table has been stripped to highlight the natural wood and then waxed with Annie Sloan Dark Wax. Autentico Sealant has been utilised to seal and protect the paint work. As this set has been hand painted there may well be signs of texture, so it is not for someone looking for a factory finish. This is a charming country cottage piece, a definite show piece for your home. As a preloved character set it has the associated knocks and dings that vintage and reclaimed furniture picks up from age and use. 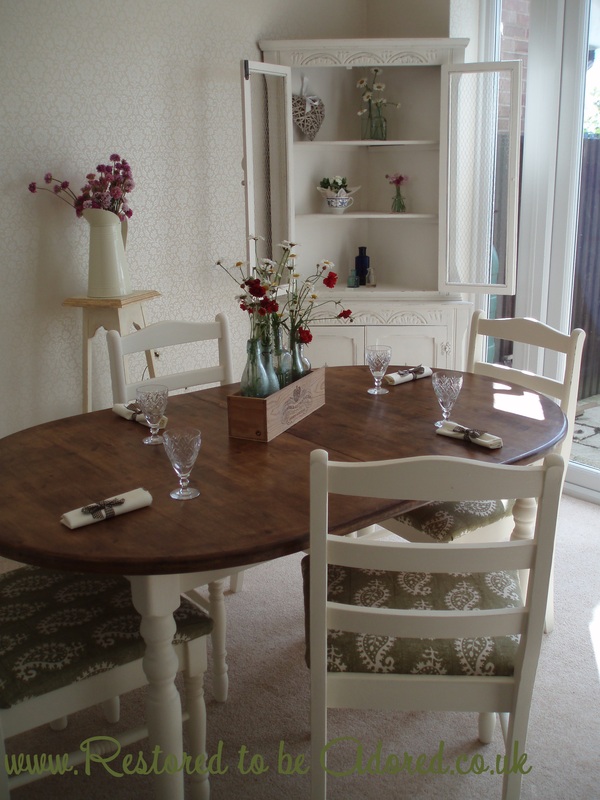 The various marks on the table add to the charm and helps create a warm vintage and shabby chic style.